The Machine is back. But does it still creak? This question loomed over the return, on Saturday afternoon, of Robert Lepage’s production of Wagner’s “Das Rheingold” to the Metropolitan Opera after a six-year absence. Mr. Lepage’s ambitious staging of Wagner’s four-opera “Ring” cycle relies on a massive, complex set: 24 planks that rotate like seesaws on an axis that can rise and fall. This 44-ton “Machine,” as it became widely known, was prone to glitches on a Wagnerian scale, starting when “Das Rheingold,” the first installment, was introduced in 2010. The planks can be twisted into sculptural set pieces and bathed in intricate video imagery. Debate among Wagner lovers over the Lepage “Ring” was heated from the start. But there was one thing everyone agreed on: The Machine too often squeaked and groaned when it kicked into action. After a major retooling, it has been tamed — well, mostly. There were occasional creaking sounds on Saturday. But things seemed to work smoothly. Those who were captivated by the staging years ago will be pleased to see the three mermaidlike Rhinemaidens, suspended from wires, seeming to cavort in the actual waters of the river, video-projection oxygen bubbles floating from their mouths to the surface, and pebbles on the riverbed rustling to their touch. We get an aerial view of the god Wotan and his trickster ally Loge walking sideways on a grand staircase down to the realm of Nibelheim in search of the dwarf Alberich. But for me, the noises and the glitches were never the real problem with this production. My main issue was that Mr. Lepage seemed to have scant interpretive insight into a work that, since its 1876 premiere, has been seized upon by generation after generation as an allegory about roiling issues of the time: a Marxist narrative of class struggle; a cautionary tale about the corrupting influence of power; a warning about environmental destruction; an absurdist reflection of nihilistic leadership. There’s certainly much in our world with which the “Ring” resonates. But if Mr. Lepage has ideas about the relevance of the cycle today — or even about who Wagner’s characters are and how they relate to each other — little of that comes through. Even though the set seemed to be working, the cast is clearly distracted by the physical demands of the production. It was hard not to fear for the feisty tenor Norbert Ernst, making his Met debut as Loge, when he had to walk backward up steep planks to report on the approach of the two giants. Why backward? Well, the wire securing him was attached to his back. There was no way Mr. Ernst could make this moment look natural. The good news is the eloquent and urgent performance of Wagner’s score that the conductor Philippe Jordan drew from the orchestra. Back at the Met for the first time since 2007, Mr. Jordan, 44, currently the music director of the Paris Opera, will assume the directorship of the Vienna State Opera in 2020. I hope this busy conductor can make time to appear at the Met in the future. He led a refreshingly lithe and transparent account of “Rheingold,” keeping things fleet and colorful during playful stretches, but drawing out dark, heaving undercurrents when the music turned ominous. There were a few too many passing fumbles in the brasses to ignore. Still, Wagner’s two-and-a-half-hour score seemed to flow right by. The standout member of the cast was Tomasz Konieczny, a powerhouse bass, in a breakthrough Met debut as Alberich. I tend to prefer portrayals that bring out Alberich’s suffering and bitterness; with a big, penetrating voice that can slice through the orchestra, Mr. Konieczny made Alberich sneering and dangerous. Once he steals the gold, forges the magic ring and becomes the gods’ powerful nemesis, this Alberich dominated the rest of the opera, rather than, as usual, a stentorian Wotan. In that role, the bass-baritone Greer Grimsley was solid, but for whole stretches his voice was leathery and dry. He came across as the suffering one, a god who already feared his time had come and gone. He seemed outmatched by this Alberich, with a breast-plated costume, looking like a kitschy reject from “Game of Thrones,” that didn’t lend him dignity. As Fricka, Wotan’s wife, the mezzo-soprano Jamie Barton seemed to be holding back some of the natural power in her voice. The result, though, was an unusually lustrous-toned and feminine Fricka. The soprano Wendy Bryn Harmer brought gleaming sound and intensity to the frantic goddess Freia, whom Wotan glibly promises to the giants Fasolt and Fafner (Günther Groissböck and Dmitry Belosselskiy, both excellent) as payment for building his castle in the sky. The rich-toned mezzo-soprano Karen Cargill, as the all-knowing earth goddess Erda; the reedy tenor Gerhard Siegel, as Mime, mercilessly bullied by his brother Alberich; Adam Diegel and Michael Todd Simpson, as the gods Froh and Donner; Amanda Woodbury, Samantha Hankey and Tamara Mumford, as the three Rhinemaidens: All sang strongly. But the singers never came together as a cast and seemed too often stranded on their own, a continuing shortcoming of this production. Its 24 planks resembling the white keys of a piano still look clunky, and regardless of the configuration they transform themselves into, they remain recognisable as planks. But thanks to extensive technical work, the massive set designed by Carl Fillion for Robert Lepage’s problem-plagued production of Wagner’s Der Ring des Nibelungen may at last have been brought under control, judging from Das Rheingold, which initiated a revival of the four-opera epic last seen in 2013. Apart from a couple of minor creaks, the performance unfolded without an apparent technical hitch, including the climactic entry of the opera’s mythical gods into Walhalla over a rainbow bridge so steep their bodies looked stretched out horizontally. Here and elsewhere, Lepage’s staging strives for special effects by exposing the singers (or their acrobatic doubles) to an apparent risk of bodily harm. The distracting tendency was part of a larger problem when the production was new: an emphasis on technical wizardry over cogent direction. Now that the technical wizardry seems to be functioning as planned, the question is whether Neilson Vignola’s direction of the current revival will bring a depth to the core drama missing previously. As the Ring’s prologue, Das Rheingold does not suggest definitive answer. But there are encouraging signs, particularly in the final scene when characters subtly react to the chief god Wotan’s ill-fated scheme to extricate himself from a bad bargain. Tomasz Konieczny’s sensational Alberich is gorgeously sung yet full of menace. Another Met debutant, Norbert Ernst, melds lyricism and acute verbal nuance for an outstanding Loge. Greer Grimsley’s ably sung Wotan projects the young god’s confidence as well as flashes of apprehension. The splendid cast also includes Günther Groissböck as the giant Fasolt, memorably poignant in giving up the goddess Freia. Philippe Jordan leads a Ring performance much like those he has conducted in Paris and Zurich: lucid, well balanced and precise (apart from some brass transgressions), but it could benefit from more fire. At curtain calls, the Met’s extensive technical crew took a deserved bow. But no opera production should ever again be as complex as this Ring. 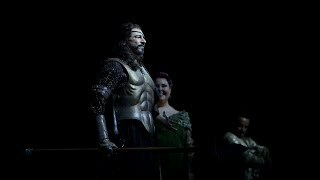 The most heralded event of the Metropolitan Opera’s season began Saturday afternoon, as a matinee of Das Rheingold kicked off the first of four complete cycles of Wagner’s Der Ring des Nibelungen. The Met has assembled an enormous amount of talent for this cycle, and Saturday’s Rheingold was buoyed by excellent vocal performances. Yet on the whole, this was a disappointing start to this spring Ring festival, failing to achieve the sense of complete immersion that makes the experience of Wagner so thrilling. The biggest problem is one there’s no getting around, at least for the moment: the massive, mechanical staging created by Robert Lepage, first rolled out in four installments from 2010 to 2012. To be sure, there are moments when Lepage’s unconventional approach seems inspired: the portrayal of Loge and Wotan’s journey to Nibelheim is breathtaking, showing body doubles climbing a massive, twisting staircase created by the segments of the machine. Unfortunately, it remains as loud as ever, contributing creaks and clanks to the score, which were especially disruptive in the unearthly quiet of the Prelude. And while certain adjustments have been made since the last outing in 2013—Erda no longer blinds the audience with a dress made of mirrors—time has not been kind to the production. The dynamic digital projections, which respond in real time to the movements of the actors, no longer seem quite so technologically impressive as they did at the premiere, making it clear that most of the opera is essentially being played on a bare stage. Lepage’s production relies too heavily on a few stunning magical effects, and then lets us see too much of the mechanics behind them, like a magician tipping his hand. Saturday was not a fine opener for the Met orchestra led by Philippe Jordan. The horns had a rough day, which was especially glaring in the prelude; what ought to have been a seamless cascade of building waves turned into a jumble. Jordan’s pacing was effective enough, but his balancing never felt right, bringing out the individual voices that needed to be emphasized and defining character clearly, while letting the rest of the composition dissolve into a general blur. He often seemed overly cautious about covering the singers, and his tight leash on the orchestra meant the size and imagination of the score never had a chance to come through. In the end, it was the vocal performances that carried the day. Most impressive was the stunning debut of Tomasz Konieczny as Alberich, who showed a complete vocal and dramatic transformation in his character over the course of the afternoon. Beginning as a sickly, awkward creature with a barky sound as he tried to woo the Rhinemaidens, he became a terrifying villain after forging the ring, with a robust, crackling bass-baritone. Konieczny’s booming proclamation of Alberich’s curse was harrowing. Jamie Barton’s rich, powerful mezzo-soprano made her a superb Fricka, with a meaty quality in her chest voice and burning vitality throughout. Her characterization was a perfect mix of pride, grief, and exasperation, betraying her frustration at her husband Wotan through the ferociousness of her singing. Greer Grimsley projected a rough nobility in his portrayal of Wotan. There’s a drawn-out quality to his voice, which shows a viscous tone but lacks the thunderous quality that helps to give the character real authority. As Loge, Norbert Ernst brought a meaty tenor in an impressive company debut. Ernst’s voice is not especially flexible, but his impish character, adding a bit of vinegar to his sound in the monologue, was perfect for the trickster. Günther Groissböck’s cavernous, rich sound was thrilling to hear as Fasolt, and he found surprising lyricism as the lovesick giant. His brother Fafner isn’t featured prominently in Das Rheingold, but one looks forward to hearing more of Dmitry Belosselskiy’s booming, colorful bass later in the cycle. Adam Diegel’s heroic, ringing tenor and martial bearing made him an ideal Froh. Michael Todd Simpson’s baritone felt a little light for the role of the thunder-god Donner, but he compensated with tremendous energy, bellowing his cries of “Heda! Hedo!” It’s hard to do much better than Karen Cargill’s ravishing mezzo-soprano as Erda, the voice of eternity, though her position under the machine during her one appearance sapped some of her vocal power. Wendy Bryn Harmer offered bright power as Freia, and Gerhard Siegel gave a sympathetic portrayal of Mime, even finding a little firmness of tone among his character’s pleading whines. Amanda Woodbury, Samantha Hankey, and Tamara Mumford all sparkled as the three Rhinemaidens, Woglinde, Wellgunde, and Flosshilde. If there’s one thing Saturday afternoon’s Metropolitan Opera revival of Robert Lepage’s staging of Wagner’s Das Rheingold demonstrated, it’s that nobody involved has a clue what Das Rheingold is about. The only other wage the builders (a couple of giants) will accept is that magic titular Rhine Gold, but the hitch is that it doesn’t belong to Wotan. He has to steal the gold from the Nibelung Alberich, who in turn—earlier in the opera—has stolen it from its rightful owners. Eventually, after two hours and change of plot complications, Wotan pays for the damn castle with his dirty money. (How dirty? Within five minutes one of the giants murders the other and transforms himself into a dragon.) The gods throw a flashy grand opening and parade into the castle over a rainbow. But here’s the funny part: after all this double-dealing and theft and murder, the castle is useless. It’s just for show. But even that plan fizzles: the next time we see Valhalla, at the very end of the four-opera Ring cycle of which Rheingold is only the first installment, the place burns up and falls out of the sky. All those warriors die (or re-die) in vain. And so, in broader terms, what Rheingold is about is the folly of throwing untold amounts of money at a project that fails to accomplish its intended function. Thus, it’s hardly a stretch to say that Wagner’s Rheingold is about Lepage’s Ring (or call it Peter Gelb’s Ring or the Met’s Ring): the tragic insanity of expending heroic effort on an enterprise doomed from the beginning to failure. No, it doesn’t matter that at long last, after almost a decade of expensive retuning, the giant set piece nicknamed “the Machine” finally can do some of its specified tasks without either clanking like a demolition derby or simply, as it did at the premiere of the production, shutting down completely because of a computer glitch. Even working at 100 percent of capacity, this production still utterly fails to recount the story in any vivid or exciting way. So far as interpretation or thematic point of view, forget about it. All we get is a gaggle of opera singers doing Tolkien cosplay while keeping their wary distance from the notoriously capricious set. About the only performers who dare to set foot on the Machine are stunt doubles. A few of those singers created isolated impact through vocal power and sheer personality: debuting Tomasz Konieczny’s bass-baritone was one long snarl of outraged dignity as Alberich, creating a thrillingly ambiguous “villain.” The mezzo of Jamie Barton, not so much dramatic as vastly lyric, made the goddess Fricka’s virtues of monogamy and chastity sound downright seductive. The majesty of Wotan was suggested by Greer Grimsley’s weathered but still assertive voice—though his dignity was undercut by his Party City costume. Tenor Norbert Ernst (styled as Mr. Humphries from Are You Being Served? on his way to the Folsom Street Fair) made admirably expressive use of the text. I liked the briskness and transparency of Philippe Jordan’s conducting (the leitmotifs pinged out with striking clarity) but the performance felt top-heavy, without much bass in the sound. At the end of the curtain calls, out came dozens and dozens and dozens of stagehands for some well-earned applause. It was obvious they had worked long and strenuous hours nudging the Machine into action. It’s a pity they had to put so much energy and passion into what is obviously a lost cause.